They dream of paradise on earth, a place where you can enjoy your vacation to the fullest, how your mood. Where the sun shines all year round and where you can be five straight without remorse? Enough dreaming - Welcome to your next vacation! Paradise Landing, the name says it all. Good mood and some clothing - all you need to bring. Whether alone, together with nice friends or your family - from wide on 200 m² living space to their hearts content. Our house is furnished with great attention to detail and extremely comfortable: Ice cubes for Coke - just press; Bring your laptop to the World Wide Web - even with high-speed connection and completely free for you! Freshly baked bread and all the food you buy just 2 minutes away by car. The first thing that stood out was the house was larger than expected. LOVED the amount of room outdoors by the pool. Fishing was great off of the dock. Short distance to restaurants and stores.Rental company was very pleasing, helpful and even recommended some places to eat :) Will for sure use them again and hopefully rent this same property ! Thanks ! This house has it all! Bright and airy and well stocked with everything a family could need. My grandson loved the pool and we all enjoyed our coffee on the patio each morning. Beds were super comfortable also! Thanks for a wonderful vacation! If you are seeking a terrific vacation home that is open, inviting, with all the toys for enjoying the sun, outdoor living and fun then you are in luck. 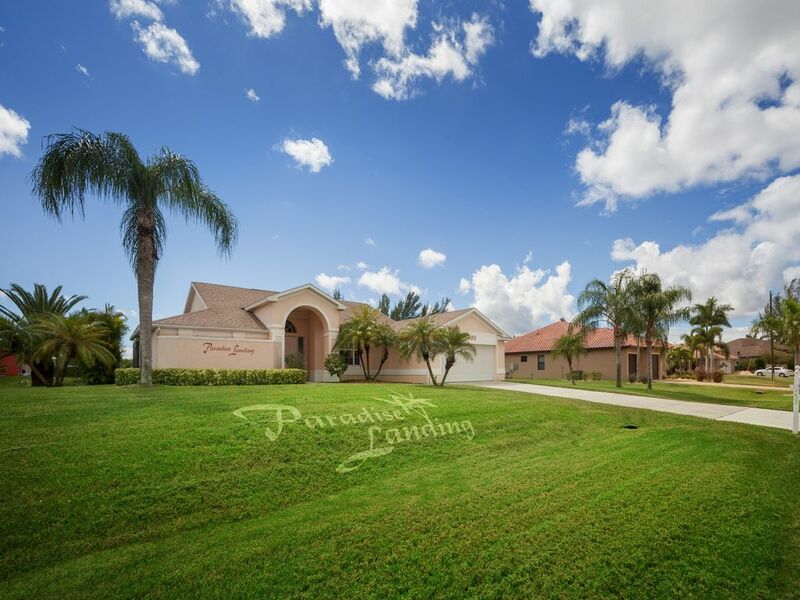 We were extremely fortunate that we were actually able to tour Paradise Landing while staying in Cape Coral last winter (2015) and fell in love with the house and property right away. This is a bright, well equipped home that Anette and Ralf not only own, but also use as their second home, so it has all the luxuries that they themselves enjoy, especially when it comes to cooking. They even provided us with a small Christmas tree to help us in joy the holidays. The pool and lanai are south facing so there is full sun all day long with a patio set that has a great shaded area as well. It has plenty of room for the (4) lounges and lots of extra space when you need to get out of the sun. The peacefulness of the waterfall was an added bonus and you have control of the temperature you want the pool heated to, which is rare, but very much appreciated. We cooked and dined outdoors for the majority of our stay (5 weeks) and loved the Grill and Dining Set in the lanai. The home has easy access to the grocery stores and great eating places in the yacht club and harbour area. We cannot say enough good things about this home and the owners and would not hesitate to book Paradise Landing again. A very well appointed home located close to all amenities. Many thanks to Anette for the easy transaction during the booking process. The home was immaculate with nothing lacking. All services from within the home were as described and certainly met my expectations. I gladly recommend this home to anyone who wants to enjoy the Cape and the service provided. James L.Where do you live? We had a wonderful stay at "Paradise Landing". I needed to have some more details about the house so I decide to call the owners and they both were very nice. Every time I wrote a mail they have always answered in less than 12 Hours. 2 pair of scissors, 3 flash light, adapters… As well as all the kitchenware, nothing is missing ! You just have to come with your luggages and make yourself home; That's exactly what we did, that is also the reason why we did our best to keep the house clean because we were so happy to stay there. I promised myself to write all this things because It's so hard to find a house as good as that one. It was our best house rental vacation. Thanks again for everything. We will come back ! Friends ask us, “Why don’t you get a condo overlooking the gulf?” and “Wouldn’t it be better to be right on the golf course?” In a word, the answer is “No.” This place is great! I can get my paper delivered to the front drive. I can do my coffee just the way I want. And then I can jump into my own swimming pool right outside my private doorway. There are no neighbors to stare at me (or me at them), and I can relax, read the paper and have my morning swim. After a day out, I can return and have my favorite beer or cocktail and have dinner cooked on my private patio grill – again just outside the doorway. I don’t have to go down two or three floors to find a community grill to use, and I can leave many of my seasonings conveniently nearby. There are obviously other properties with these general positive attributes. However, we have had friends in for parties on several occasions, and we have gone to other houses and condos that some of those people own or rent. The openness of the Paradise Landing interior, the size and convenient layout of the patio, and the heated pool with waterfalls all contribute to comfort afforded by Paradise Landing. Based on our opinion, and also based on the comments of our guests, Paradise Landing is a great place to relax alone and also a great place to socialize with friends. And the new plantings by the pool just increase its appeal. We keep going back year after year. Holiday villa with 3 bedrooms and 2.5 baths directly on (salt water) channel. South facing, large pool and terrace. Golf: Over 100 (!) Golf courses within a radius of 30 km.